Across the United States, customers count on Pros On Call for top-quality installation and repair services for panic bars. Our nationwide company maintains branch offices staffed by highly skilled local technicians. Contact us for assistance whenever you require the talents of a knowledgeable, dependable locksmith! We are licensed and we can arrive at your location quickly at any time off the day or night. Our commercial locksmiths are the best in the business when it comes to securing your property with panic bars (aka: push bars). Call now to learn more. Across the United States, customers count on Pros On Call. Our nationwide company maintains branch offices staffed by highly skilled local technicians. Contact us for assistance whenever you require the talents of a knowledgeable, dependable locksmith! And when your business needs professional installation or repair services for panic bars (aka: push bars or panic hardware), we’re the best there is. Why do so many business owners make us their locksmith of choice? We hope our dedication to providing superb customer service accounts for our popularity. Our skilled technicians work for a licensed, bonded and insured company. We strive to provide value and accurate information during service calls. For instance, we sometimes consult with customers about their best options for resolving lock-related security concerns and which types of panic hardware is best for their property. Our panic bar installation and panic bar repair services illustrate how vital our skills become in some situations. You’ve probably seen panic (or “push”) bars in numerous public settings. These spring-loaded bars (or sometimes levers) offer a fast way for patrons to exit from a building during emergencies. Today, most businesses, offices, government agencies and medical facilities strive to keep these devices in good repair. Seamlessly functioning push bars help save lives. They open easily and can prevent horrific trampling injuries from occurring when a frightened crowd of people attempts to surge through a doorway quickly. 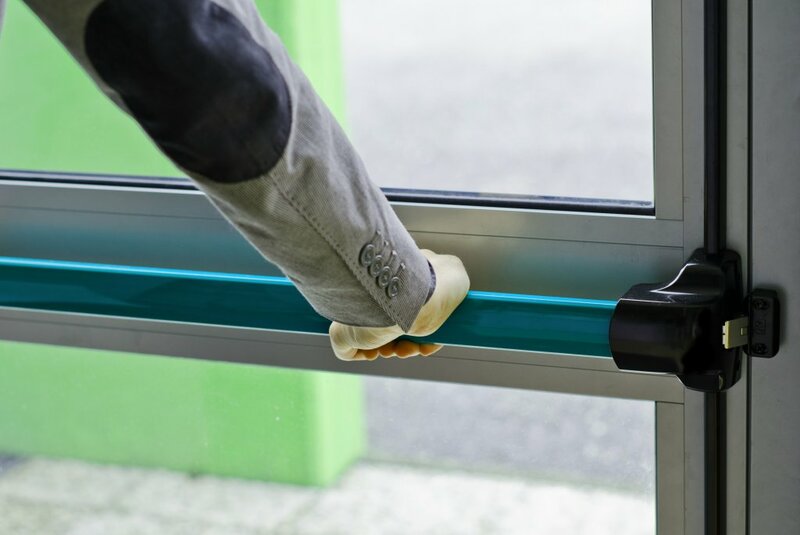 Call us to receive experienced assistance maintaining your building’s push bars in excellent working condition! Sometimes also described as “crash bars”, these useful items of door safety hardware occur today in many different dimensions, styles, and colors. But with so many options, how do you choose? Our lock service experts will gladly help you locate the best bars for specific doors in your facilities. For instance, we can install panic bars on double doors or single doors. We’ll also help you match the color of the bars to your decor if you prefer. These devices have become widely popular because they permit easier exits from a building. While most construction codes today require them in designated locations, in many cases customers install crash bars on certain doors even in the absence of a regulatory requirement. Attractive and easy to use, push bars represent a wise investment in public safety technology! Contact Pros On Call to obtain fast, reliable locksmith assistance. We hope you’ll choose us as your preferred 24-hour locksmith. We offer a full range of commercial, residential, automotive and emergency mobile lock services, including panic bar installation and repair. Call us today to install or repair crash bars, or to perform any other skilled lock-related service! We provide professional, certified service for all your security needs both commercial and residential. We specialize in advanced locksmith services, full garage door installation or repair and corporate security such as access control and CCTV. Panic Bars https://prosoncall.com/locksmith/commercial/panic-bars/ 4.3/5 based upon 30 reviews.